This is the multi range lure rod that was designed and tested for soft lures to around 9″ and hard lures in as wide a range (length and weight) as possible. It is super fast, loads very easily and rewards the angler with long, controlled casts at ranges other rods cannot match with this amount of control. It works with ‘everything’ but, as most testing was done under the cover of darkness, you can pretty much work this rod with your eyes closed. It excels with weightless soft lures like senko’s and sluggos from 4 – 7″ fished in the soft needle style and yet, will work a top-water bait equally well whilst being a dream to work slim minnows at any depth. Because of it’s super, super fast recovery and balance system, it doesn’t throw wild loops of braid off the rod top which can lead to horrible braid knots when fishing weightless styles. 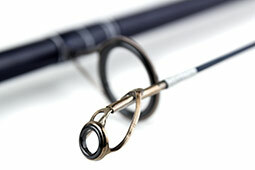 Again though, this rod has been built for the modern lines that are available on today’s market. 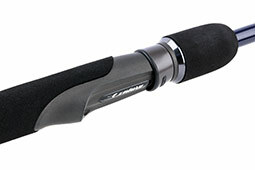 The power and compression reserves in this rod are truly unique; it is not at all stiff, never locks up and just delivers more as required. 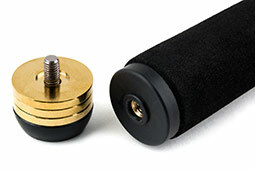 Supplied with optional counter balance weight system for optimal reel balance setup. 3" 4 ½" 5 ½" 6 ½" 8" 9 ½" 10" 5 ½" 12"